A rendering of the proposed 20,000-seat Harambee Park Olympic tennis venue, with a permanent 2,500 seat stadium on the left side of the rendering, and two temporary stadiums, courtesy of Boston 2024. Rendering by Neoscape. 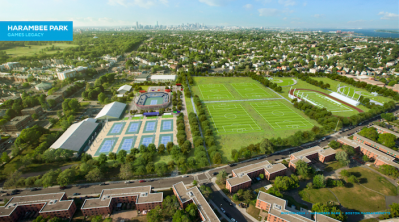 Organizers behind Boston's bid to host the 2024 Olympic Games will announce today that Dorchester's Harambee Park would be a tennis venue for the Games should they come to Massachusetts–replacing previous plans to site the venue at Harvard University. The venue plan includes a permanent 2,500-seat stadium that will be left behind after the Games, as well as temporary structures to bring the total venue's capacity to 20,000 seats, according to those with knowledge of the plan. The venue will see five events take place over nine competition days during the Olympic Games and six events over nine competition days for the Paralympic Games. The venue will also utilize the existing six courts belonging to the Sportsmen's Tennis and Enrichment Center that is located in the park, according to Sportsmen's executive director Toni Wiley. "I just think this is phenomenal. It’s a beautiful space and underutilized, and it is close to the Fairmount Line," Wiley told the Reporter on Thursday. The Harambee Park venue is a piece of the puzzle for Boston 2024's gradual roll-out of an updated bid document, known as Bid 2.0, to the public by the end of the month. Wiley said 2024 approached her and the association in April to suggest the venue location. Negotiations were finalized as recently as last week, she told the Reporter. "This would be a way to have a real lasting impact on the community that could use this kind of investment," Wiley said. Wiley, who has been executive director of the center since 2008, has lived on a street adjacent to the park for her entire life. Wiley and State Rep. Russell Holmes will attend Thursday afternoon's press conference about the venue to signal their support for the proposal. Both told the Reporter they support efforts to bring the Olympics to Boston. "I think that we're seeing a reorientation to neighborhoods, particularly neighborhoods here that need more services, and it's the important way to do it. It’s an important message," Holmes said. Holmes said Boston 2024 reached out to him about the venue two months ago but urged organizers to work through Wiley before him. Once Wiley indicated she and the organization were on board, Holmes began circulating the idea with locals including residents at the nearby Franklin Field Family public housing development over the last three weeks. "There are some folks who have been reluctant because there’s just not enough information out there," Holmes told the Reporter on Thursday. "After we’ve had longer discussions, folks have been much more receptive, particularly when I have them bring up what they would need space-wise after the Olympics have left." Holmes said he is also working with the city and 2024 to create and fund a new Main Street business district in the Blue Hill and Talbot Avenue area. "One of the things I’ve been saying is that the neighborhood isn’t ready for something this big when it comes to stores and vendors on Blue Hill Avenue and Talbot Avenue. If they do leave behind a stadium, how do we encourage those businesses in the area in advance to see that we'll see more business and encourage them to invest in their businesses." Transportation to and from the area is a significant consideration, Holmes said, with current plans to bring people to and from Harambee Park using private busses along a so-called Olympic Lane and using the nearby Fairmount Line Commuter Rail. Willie Hicks, owner of Hicks Auto Body on Talbot Avenue— right across the street from the proposed Olympics venue—said he would support the idea. "It's a good thing if it happens," said Hicks. "It would be a big boost in the arm if, when they are done, it leaves a substantial imprint that reflects a coordinated effort in the community." The Boys and Girls Club of Boston, whose Franklin Field clubhouse occupies a corner of the park, declined to comment before the roll-out and press conference this afternoon. The next steps for the venue, Holmes said, will be an extensive community process about what will happen to the park after the Olympics wrap. "What we want is to announce the venue today and then come back with more formalized 'this is what could be here' to the community," Holmes said. "And then it is a blank slate for what the neighborhood wants." The Harambee Park venue location was first reported by The Boston Globe.